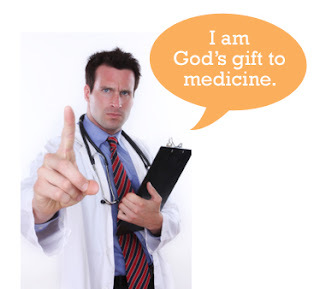 Dr.Malpani's Blog: Why is it so easy to brainwash doctors ? Most patients ( and family doctors as well) have high regards for the skills which medical specialists possess . Because they see a lot of patients with one particular problem , they develop a lot of technical expertise in one particular area . However, this actually creates a new set of problems. Because they have so much depth of knowledge in that particular field, they are pretty clueless about what's happening in other parts of medicine . They tend to become fairly rigid and dogmatic as they get older, and their attitudes harden, just like their arteries do. As they get older, they start thinking they have all the answers. After all, aren’t they the doctor’s doctor ? Don’t other specialists refer patients to them ? Aren’t they invited to give talks at conferences ? Don’t pharma companies pander to their whims and fancies because they are considered to be KOLs ? They are no longer willing to accept patients’ opinions , or the viewpoint of alternative medicine practitioners . This is a disservice for the doctor himself , because as long as you keep your mind open , you are likely to learn new stuff. The moment you close your mind because you think you know everything , your ability to learn becomes much less . It’s unfair for the patient as well , because there may be multiple ways of treating a particular problem , and it's not possible for an individual specialist to have a monopoly on knowledge. It’s surprising that they become so rigid in their views . Because they are highly educated and well trained, one would expect them to be able to keep an open mind . Ironically, it’s the fact that they require so many years of training to become specialists that causes them to become so rigid ! Medical college training is a bit like going to bootcamp. You are subjected to brainwashing, until you learn to adopt the social and cultural norms of the medical profession. As you progress through medical training, you adopt the maneersims and traits of your professors. You start to think of yourself as being a specialist – some who has trained hard for many years, and has tons of expertise and knowledge , which makes you superior to the poor layperson or the patient who has come to you , asking for help. Patients put their doctors on a pedestal, and this reinforces their opinion of themselves as being special ! Because you have spent so many years learning a particular topic , you understand all its arcane details and technical niceties the ins and outs . You spend hours studying fat medical textbooks and poring over medical journals , which no one else can make sense of . Because you work in a prestigious hospital, everyone defers to your opinion, and listens to what you have to say . Also, because you are a doctor, you tend to associate with other doctors , as a result of which you reinforce each other's viewpoints . You adopt a particular worldview – and because you do not interact much with people outside your own specialty , constant inbreeding just reinforces dogmatism ! Because getting into medical school is so competitive, doctors are often intellectually arrogant, because they could clear all the examination hurdles, which the other students could not. Doesn’t this confirm they are smarter than everyone else ? This is why they don’t listen to alternate points of view – after all, if the other guy is not as intelligent as you, what’s the point of wasting time talking to him ? Pharmaceutical companies play a big role in reinforcing this attitude, because they spend so much money massaging the doctors’ ego. Doctors start getting used to this red carpet treatment. – and this is just made worse by the fact that there are so many patients who treat their doctor as god ! I do not think doctors want to harm patients – it’s just that their parochial and narrow worldview is constantly reinforced by the people around them – both those in the profession , and those outside . As a result of their arrogance, they indulge in groupthink and start assuming they have all the answers ! This is why they will not respect the patient’s perspective – or that of an alternative medicine practitioner ( whom they often dismiss as quacks). Fortunately , there are enough senior doctors who understand that we don't have all the answers , and are willing to keep an open mind and listen to their patients. It’s because of these doctors that that medical science continues to evolve and make progress – otherwise we’d be stuck in a rut! There are good and bad professionals in every field. I think it is the experience that teaches one how to behave or respond in alarming situations. Nonetheless, I agree that I have seen patients overwhelming doctors. This is something that needs to change.